Innovation is today on top of the agenda of managers, entrepreneurs and policymakers. It is an opportunity to develop and grow new business models but also a threat to existing ones. It is also a societal challenge, as entire professions disappear while new ones are created. Simply ignoring innovation is therefore not an option. But innovation debates too often seem more like buzzword competitions than rigorous management thinking. From digital transformation to industry 4.0, from sustainable business models to crowd-hackathons, managers can get lost in what has often become a confusing maze of ideas, concepts, tools and initiatives. As a consequence, too many managers, entrepreneurs and policymakers still live and think in “innovation wonderland,” a place where great opportunities are just an ideation workshop away, where spending more on R&D or creativity sessions is the key to success, where crowds always have wisdom and where being the first to invent is always the winning option. But in the real world of innovation, opportunities must be hunted and matured, distinctive innovation management capabilities must be developed and tough strategic choices regarding innovations must be made. Being a very creative business is one thing; successfully managing innovations is another. The key to innovation success is to do much more than generate ideas. 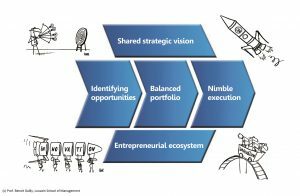 The key to innovation success is to have an organization capable of effectively identifying, prioritizing and capturing innovation opportunities, in line with its strategy and ecosystem. The key to innovation success is therefore more “brain” and less “storming”! You will find in this site some key insights and selected references, organized along those five innovation challenges and the key issues they involve. Feel free to explore them using the menu in the left column, or get the book to access the full content. Welcome to the real world of innovation. Fasten your seat belt and enjoy the journey! Adapted from Gailly B. 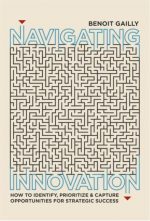 (2018), Navigating Innovation. Reproduced with permission of Palgrave Macmillan.